Artistic Synaesthesia in the Apartment of the Manager of Woodkid. They love art in every shape and form and they chose their job according to this passion. Pierre Le Ny and Emilie Urbansky, after having visited the Parisian museums and the flea market of Saint-Ouen when they were children, now manage the career and image of talented artists, at Modernist (management and art direction company working with Woodkid and The Shoes among others) for him and Sony Music Entertainment for her. They are continuously looking for innovation that would enable them to help their talents coming to fame, accompany them and build their careers by offering them made-to-measure proposals. 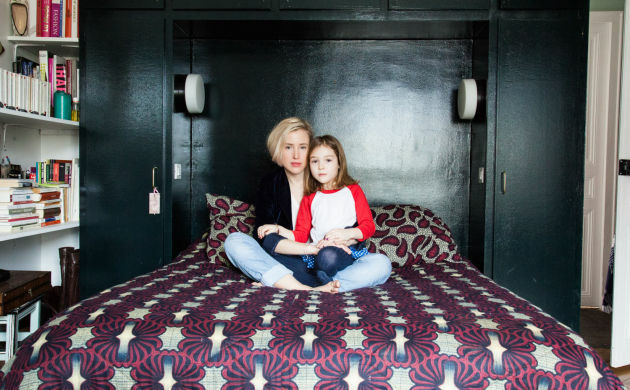 We notice the influence of this true role in their apartment. The couple naturally shared the missions. 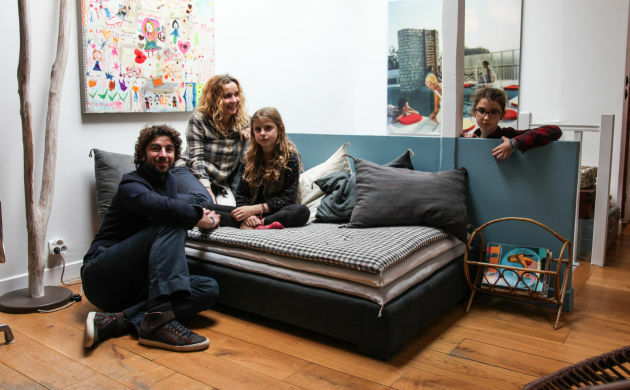 Pierre chose the furniture, while Emilie was selecting the decorative objects. 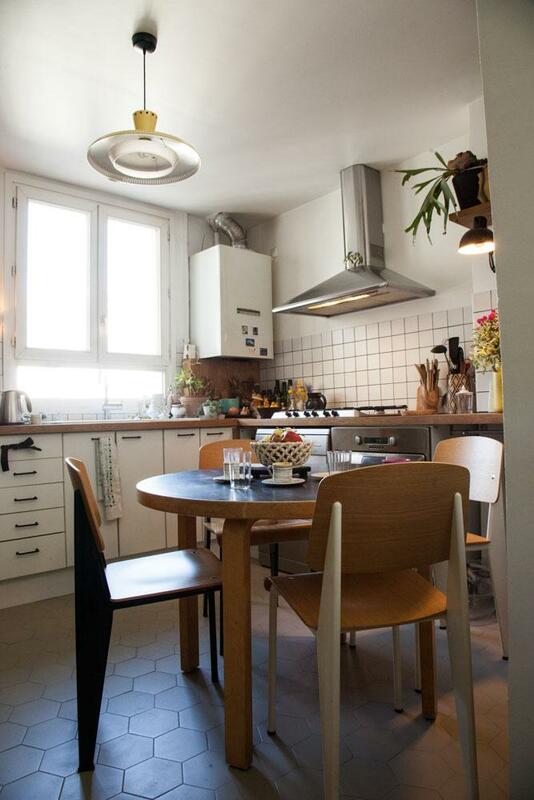 Gio Ponti meets Pierre Chapo, Hans Wegner and Mogensen in a Haussmannian and coloured setting. The mix of influences wisely orchestrated around a blue spotted in the Quartier Moderne Frugès by Le Corbusier in Pessac marks the spirit of this particular place since the living room. 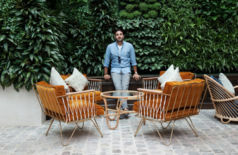 The French design from the XXTh century is Pierre’s main reference – and more particularly the Reconstruction period – and is omnipresent, through the creations of Jean Prouvé, Marcel Gascoin and Pierre Jeanneret, whose Easy Armchairs come from the gallery Bouvier Le Ny. Yes, Pierre is also a gallerist and thought Jean-Baptiste Bouvier was the expert partner he needed to unite the arts. This double hat leads him, just like home, to manage the creation in its totality. Papa Bear armchair by Hans Wegner for AP Stolen studio in 1951. Office Chair, Pierre Jeanneret, circa 1955. Teak structure, seat and back in caning. Legs in birch, reupholstered in sheepskin. Pierre, Émilie, can you introduce yourselves? I grew up in the Parisian suburbs, in Chaville, and studied in Versailles. I started working in 1999 as a press attaché in music. I am today an artists’ manager (Woodkid, The Shoes) and freelance art director sound & image, with my company Modernist. In June, I founded the gallery Bouvier Le Ny with Jean-Baptiste Bouvier. I came to Paris to study literature and art history. I was a student at the Ecole du Louvre when I was offered a job at Delabel (an indie label which produced The Chemical Brothers, The Verve, White Stripes, Gonzales, Feist, Placebo). I first worked for the communication department, and I then started working for the art services Images. I am now the Manager of Image for Sony Music Entertainment. 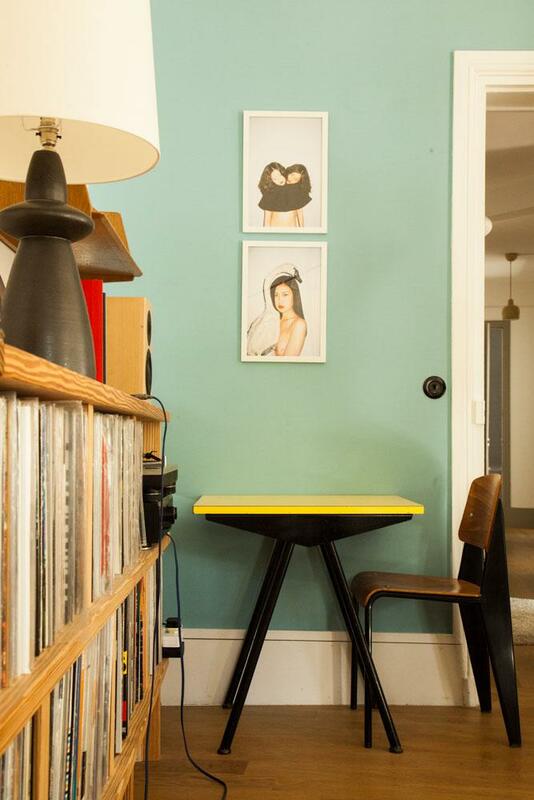 Music, decoration: can we say art is an integral part of your life? Art is a real driving force in my life. It inspires me every day, gives me ideas, makes me pick up on an idea. My parents took me to the Parisian museums my all childhood. Every Wednesday, we’d go to the Louvre, Orsay, Cluny… It was the same for Emilie! Yes, my family and I used to visit the museums and to stride along Saint-Ouen flea market during the holidays! Music appeared very early as well, with the conservatoire and my elder brother who is a musician and who gave me the taste for this and the will to work on it. So yes, we can say we have been surrounded by art for a long time, and more and more. In its most serious or most frivolous forms! Pierre, how do you make your choices? Emilie, what makes you bet on an artist rather than on another one? The emotion brought by an artist is the basis. I don’t think about the efficiency or the sales in the first place. I love building careers and strong identities; as strong as the people behind. I love helping them to come to fame without forgetting that they have to be different and to innovate. My job mainly consists in discovering new talents. I love the innovation laboratory part of it: it’s really what I prefer and there, intuition is the priority. And curiosity, which has to be permanent for everything we do! Yes! Photographers, video makers, designers, fashion designers, choreographers, illustrators… They have to be spotted so we can make personalised suggestions. “Form is the substance which surfaces”, Victor Hugo said. I think it’s true for every field, so the idea is to combine the best expression vectors! Pierre, why did you open a gallery? Because the house was full! It’s true! But also because design is my other passion. They are two fields which perfectly echo each other, so I thought: why would I restrict myself to music? I have always loved managing the creation in its totality: work with the artists, create the image, sound, marketing and communication. Apart from the sound, the process is the same with the designers, so I realised I could completely take this new gallerist activity on while working in the music industry. I like the double hats. Gallerist and manager, I like it! Joining the arts as the magazine L’Esprit Nouveau did it in 1920 is something essential to me! 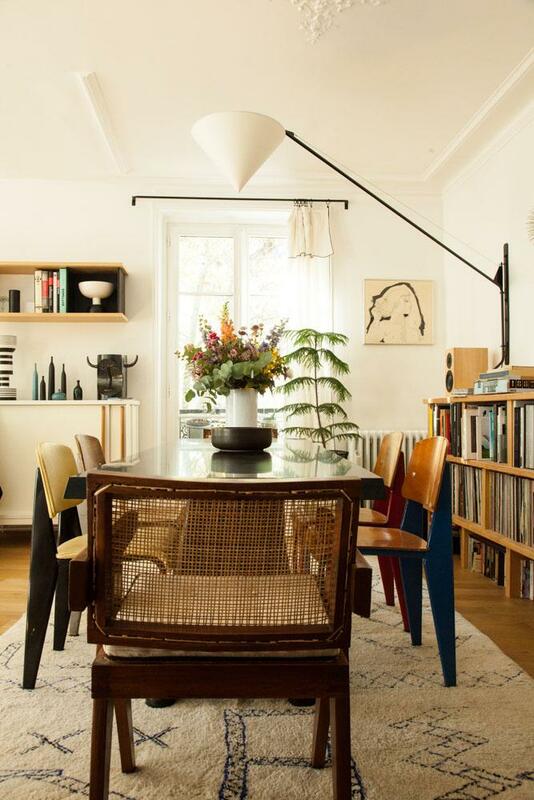 Is French design from the XXth century a reference for you? It’s my main reference, yes, from 1928 to the end of the 50’s. The French Reconstruction is fascinating! What we today call design arrived late in France. I am less monomaniac than Pierre is. I love the American, Italian and French designs! I love them too, but I prefer the functionalist and modernist pure lines of the XXth century French design. My admiration for Jean Prouvé’s and Robert Mallet Stevens’s works knows no bounds, if I had to quote but a few. The French Union of Modern Artists (UAM), founded in 1929, really gathers the artists and the period I prefer. The gallery Bouvier Le Ny is the clearest expression of this. By the bye, at home, it’s more mixed and eclectic. If I listened to myself, it would be even more, but he tells me a lot when talking about objects “Ah this would suit more to the summer house”, that we don’t have, of course! 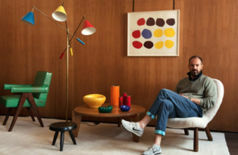 Pierre, at home, do you own one or several pieces of furniture from your gallery? Yes, we have some, such as Marcel Gascouin’s stools and the Easy Armchairs by Pierre Jeanneret for Chandigarh. What would your favourite be? A Métropole 305 chair, by Jean Prouvé, with the PTT stamp under the seat bottom. 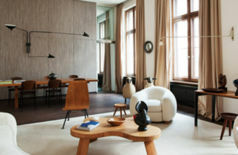 How did you design the space and the decoration of this apartment? We both worked on it! I really know about furniture, and Emilie focuses more on the decorative elements, photos, plants, etc. We perfectly complete each other. We mixed our influences in order to appropriate places which did not look like the way the look now. We opened everything, painted a wall in this blue we had spotted in the Quartiers Modernes Frugès by le Corbusier in Pessac, but we kept the Haussmannian elements. Pierre, where do you go to find your famous pieces of furniture? The question I am always being asked: “But where do you find your furniture?” I find a small part on the Internet, on two big websites everyone knows! But that was at the beginning; now, unfortunately, I don’t find a lot of things. I also bought pieces of furniture in diverse warehouses and Emmaüs in the provinces, and in flea markets. But it’s the same there: I wish you luck! And then, finally, Saint-Ouen flea market. This is how I met Jean-Baptiste. Is there a designer and a period you particularly like? Yes, a designer! Jean Prouvé. His work crosses the years, and I will never get tired of it. In my opinion, he is better than anyone else, and his current ratings are neither a mystery nor an aberration given the quality of his creations. I also like the after-war movement and the Reconstruction with Marcel Gascoin’s works for Le Havre and the work of Perret. I like the preciseness and the rationality he brought in all his pieces. His little shamrock stool is a real sculpture, and his shelves are fine and light. In a more “deco” style, Gio Ponti’s work is remarkable. The brass and velvets are very present nowadays and were already his favourite materials in the 50’s. 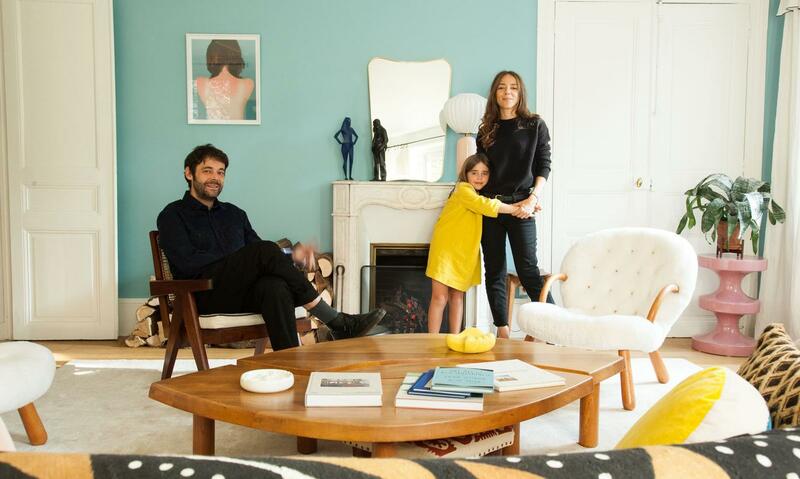 In a more contemporary register, India Mahdavi’s work also delights me. 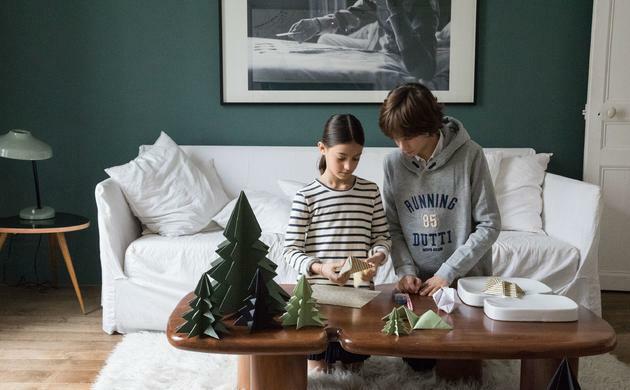 Is decoration a family matter? I would say more a couple matter: I show her things, and she makes me discover others. My parents are confirmed bargain-hunters. When I was a child, I didn’t want to go the flea market, but now I like going there to see beautiful things. We bring back a lot of trifles from our trips! How do you make your daughter learn about it? We show her, try to explain it a little. I found her some pieces adapted to her age (Pelican lamps). She will teach herself alone if it interests her. We’ll see. When I was child, I went past Jean Prouvé’s houses in Meudon, just next to my parents’ house, and I thought it was horrible. Today I can stop in front of them every time without getting tired of it. Actually Anouck and I can’t take any more! Do you have a piece you are particularly proud of? My eye coffee table by Pierre Chapo, bargain-hunted in a grandma’s house several years ago, for a very interesting price. 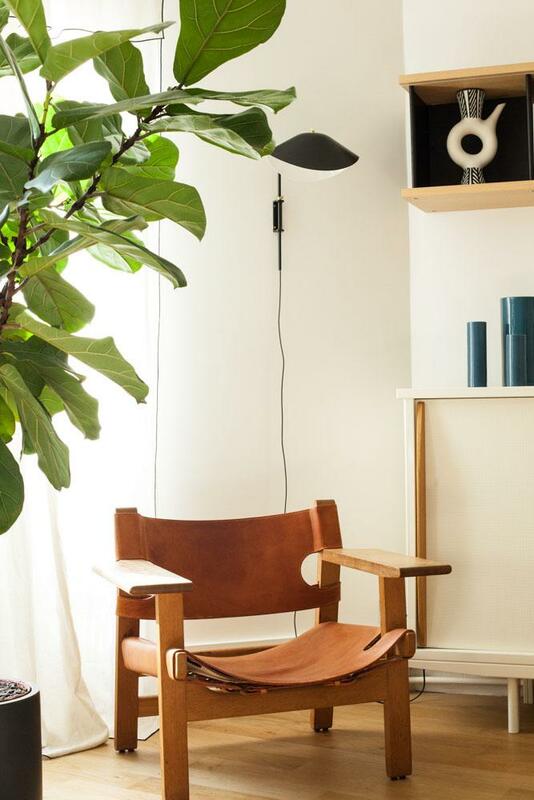 The Spanish Chair by Mogensen, that he offered me a long time ago. It looks like a small bull. I will work on the next albums of my artists, work with new ones, and develop my activity of art manager. I will also develop my gallery through exhibitions of contemporary artists (photos, paintings, ceramics), always linked to the furniture we show and, of course, hunt for exceptional pieces! Study the African art, find some pieces that will suit perfectly my home, harass Théo Mercier so he would sell me one of his totems and launch a photographs prize! Do you have places to recommend us in Paris or elsewhere? For the furniture in Saint-Ouen, I recommend the markets Paul Bert and Biron. In Los Angeles, the gallery on Melrose Avenue and the huge warehouses of JF Chen: piled up design pieces from every period. It is a mess but it is something you must do at least once! For music, Rough Trade East, in London. The traditional markets in all the coutries. In London, there are the unavoidable Liberty and Dover Street Market, mainly for clothes. Margaret Howell as well for clothes, but especially for Nicolas Tassie’s ceramics and the antique dealers around! I prefer the functionalist and modernist pure lines of the XXth century French design. My admiration for Jean Prouvé’s and Robert Mallet Stevens’s works knows no bounds, if I had to quote but a few. This classic wall mirror was designed by Gio Ponti in 1933. Lines combining 1930s style with traditional elements. Don giovanni made with bohemian glass. Designed by India Mahdavi. Emmanuelle sculpture by Xavier Veilhan. Clover stool, ca 1953 made of oak, designed by Gascoin. The Most Bohemian Restaurant-owning Couple in Paris. The Innate Sense of Mix and Match.